Baez, A.; Lehmkuhl, O.; Perez, C.; Oliva, A. The Kinetic Energy Preserving Scheme (KEP) for compressible flows has been shown to solve 1-D shock waves without smearing them. The method does not add numerical diffusion to solutions but, as a counterpart, it needs very dense meshes in order to be Local Variations Diminishing (LVD) and stable. For 2-D and 3-D geometries, the method needs unaffordable meshes. A Filtered Kinetic Energy Preserving Method (FKEP) that partially solves this issue is presented in this document. The method filters the solution obtained by a KEP at each time step. It is shown that the use of filters does not significantly change the low frequencies of the motion while it enables the use of much coarser meshes.FKEP is tested on the 1-D shock tube. Baez, A. [et al.]. 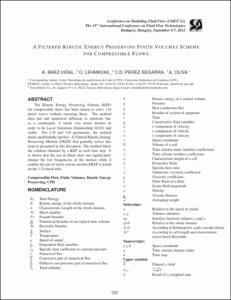 A filtered kinetic energy preserving finite volumes scheme for compressible flows. A: Conference on Modelling Fluid Flow. "Conference proceedings: Conference on Modelling Fluid Flow: CMFF'12: the 15th event of international conference series on fluid flow technologies held in Budapest". Budapest: 2012, p. 987-994.